Click the "Email Settings" command on the Options menu. Click the Settings button when configuring an email reminder for an event or task. The Email Settings tab of the Options Window enables you to specify your email settings. 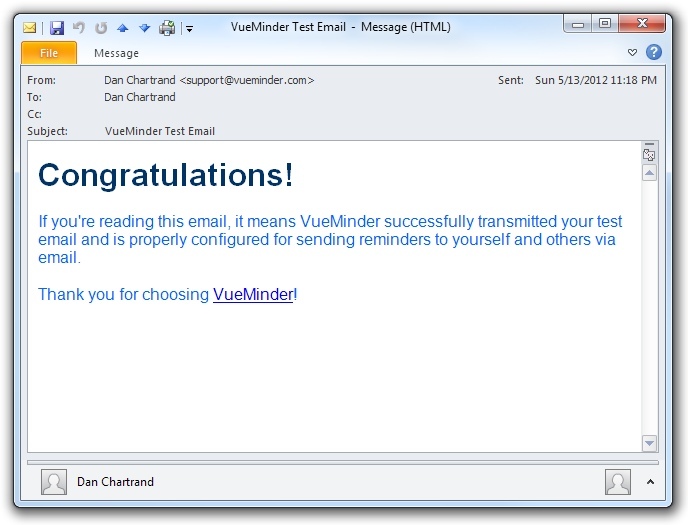 These settings are used by VueMinder when sending email reminders. These settings might also be required for sending text message reminders, depending on your SMS service. In addition, these settings are used when sending meeting requests and responses. A button is provided at the bottom of the window for testing your settings. One very common problem sending email is caused by firewall or security software that blocks VueMinder from transmitting email. If you encounter any problems, and you're sure the specified settings are correct, try adding an exception for "vueminder.exe" to your security software. There are two options for the email provider. 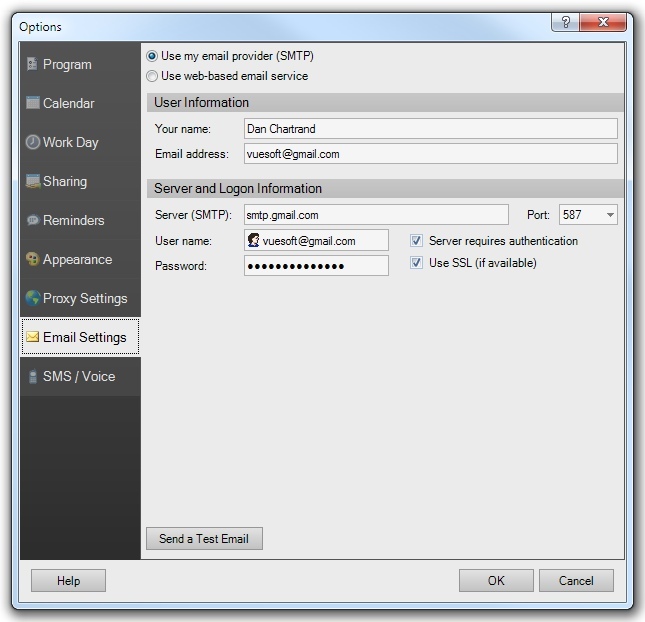 The default is to use your current email provider, which requires a compatible SMTP server. Yahoo Mail, Windows Live, Google Mail, and most ISPs provide compatible SMTP servers for sending email reminders. However, there are some email providers, such as AOL, that do not have compatible SMTP servers. If your email provider doesn't offer an compatible SMTP server, or if you're confused about the values that should be entered, a simpler option would be to use the web-based email service, which only requires a username and password. Email reminders sent using the web-based service are reasonably priced, usually 1 cent ($0.01 USD) per email reminder. Signup is free and there is an option to pay as you go, instead of being locked into a monthly contract. To use the web-based email service, click the option at the top of the window. The window will update as shown below, simplifying the setup of email reminders. If you don't have an account, you can request one here. The name you enter here will be the name displayed in the "From" line in email reminders. The email address will be the address that email reminders are sent to when sent to yourself. It will also be the reply-to address when email reminders are sent to other recipients. If your entered email address is using a common email provider recognized by the program, such as gmail.com, the server and port information will be automatically filled in. The username does not need to match the email address entered in the User Information section. For example, you business could have a common account that all employees use. Depending on your email provider, these settings will vary. If you're not sure what settings to use, check with your email provider or contact VueSoft support. Your outbound SMTP mail server needs to be specified. The server port can also be specified. This is usually 25, 465, or 587. If you email server requires a username and password (most do), the "Server requires authentication" box should be checked. Enter the user name and password that you use to connect to your mail server. The password will be saved locally using 256-bit encryption. If a user name and password are not required, uncheck the "Server requires authentication box". If your email server supports or requires SSL, check the "Use SSL" box. 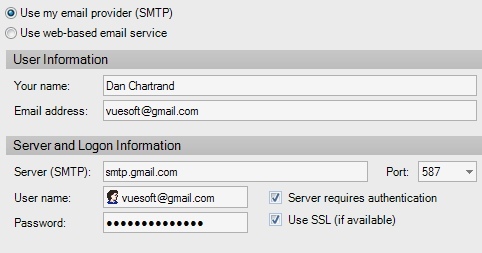 This increases the level of security when VueMinder sends email. Note, this usually requires port 465 or 587. If you don't receive this message after waiting several minutes, double-check your settings to ensure they are correct.